Is fast food good or bad for brain health? I am not sure about you. I can easily access to any fast food restaurant like McDonalds, Kentucky Fried Chicken, Burger King.. Sound familiar to you right? Yeah..They are all fast food restaurant chain store that has infiltrated every nook and cranny in the western countries. You see, eat too much fast food like hamburgers, hot dogs is not good for our health. Moreover,the effects of fast food on brain health are very deleterious. 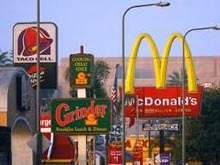 The consumption of fast food has been extensively increased during last few decades. The easy life style and shortage of time has shifted the trend of eating towards consumption of fast food. People eat whatever they get without thinking what effect that thing would have on their health. The effects of fast food on brain health are in particular very extensive because brain is the most sensitive part of our body and anything that affects our general health also affects the health of our brain. The effects of fast food on brain health are addictive in nature. Fast food is mainly composed of two major components: sugar and wheat. Experiments on mice proved that those mice that were repeatedly give food resembling fast food had increased release of “dopamine” in their central nervous system. Dopamine is a neurotransmitter that creates a feeling of euphoria and relaxation but repeated release can lead to mental disorders like anxiety, depression and even hallucinations. So the effects of fast food n brain health include depression of brain functioning and increased dependence on fast food. The major effects of fast food on brain health are mainly related to the development of atherosclerotic plaques (fat plugs) in blood vessels. A diet high in saturated fat, such as fast food, leads to the formation of such plaques in walls of blood vessels. The caliber of blood vessels continue to decrease over time and a time comes when the blood vessels are completely closed. When this happens blood vessels rupture due to the building blood pressure. If this happens in brain, it is called “brain hemorrhage” or “stroke”. During brain hemorrhage, supply of blood to the brain tissues is completely blocked and brain tissues start to die without oxygen and nutrients. This leads to permanent brain damage and disturbance in behavior and normal body function. Studies have proved that diet rich in anti-oxidants, unsaturated fatty acid, proteins and low in saturated fatty acids is best for our brain health. Fast food is extremely lacking in all these essential components of healthy brain diet. A high level of cholesterol and saturated fats has effects on brain health including negative affect growth and development of brain neurons. The responsiveness of neurons to particular stimulus is decreased extensively. Cognitive and problem solving skills of a person are affected badly. In short fast food decreases the sharpness of mind. Fast food like, different soda drinks, shake and burgers, are rich in sugar. When body is exposed to an elevated level of sugar, it responds by increasing the level of insulin. But fast food consumption can lead to the development of “tolerance” to normal insulin levels i.e. 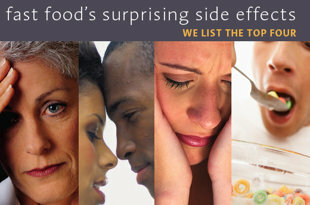 blood sugar does not profuse into the cells and serum glucose level starts to increase. This elevated level of glucose cause serious complications of heart, kidney and brain. 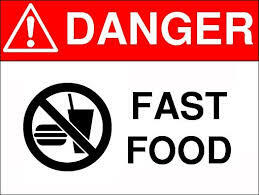 So the effects of fast food involve increased chances of stroke due to hypertension caused by elevated blood glucose. Experiments performed on animals proved that those animals that were fed on food resembling fast food , high in cholesterol, saturated fatty acids and sugar, had effects on brain health that resembled a condition called “Alzheimer’s disease”. Effects of fast food on brain health include development of Alzheimer’s disease like symptoms. The person seem to forget things easily (dementia), learning of the person is impaired, there is no consolidation of memories, communication skills are demented, social behavior becomes abnormal and person is unable to perform normal physical activities. Effects of fast food on brain health are mainly harmful. So usage of fast food must be avoided. Diet must be rich in fruits, vegetables, cereals, pulses and low fat meat products.